With the exception of the track focused 500 horsepower 911 GT3 and 700hp 911 GT2, the Porsche 911 Carrera GTS is the most powerful rear-wheel drive 911 money can get you. It’s yet another in the line of turbocharged 991.2 generation 911s that don’t bear the ‘turbo’ badge. In Carrera GTS guise, it packs the wider body from the Carrera 4 on a RWD package, a more powerful engine, and all the performance packages pretty much arrive as standard – It’s one giant performance package Carrera. Where the 911 Turbo is more akin to a supercar in its performance, the Carrera GTS is the pinnacle of sports car 911s. With the standard Sports Chrono package, the interior of the GTS features the analog stopwatch atop the dash and the 918 Spyder inspired drive select switch on the steering wheel. There’s the same touch screen system found across the rest of the updated 991.2 range, with the same clutter of buttons beneath it – a clutter that shows this as a mere update rather than an all-new 911 model. Elsewhere, the cabin’s layout is logical and ergonomically accurate, if staid. Most of the cabin trim is the same as lesser Carreras, but instead of chrome and aluminum trim elements the GTS uses black trim pieces which feel surprisingly cheap. The rest of the package feels as solid and as high quality as we expect from Porsche, and the cabin features the same 2+2 seating layout with semi-usable rear seats for short journeys that fold away to reveal 9 cubic feet of cargo volume. The 3.0-liter twin-turbo flat six lurking beneath the rear deck lid is largely the same as the Carrera’s, but the turbos are bigger and pump an extra 2.1 psi worth of pressure through the intake. The recipe serves up 450hp and 405 lb-ft, directed to the rear wheels via two 7-speed gearbox choices – a manual or dual clutch PDK automatic. With the latter equipped, 0-60 arrives in a mere 3.5 seconds, and while the new boosted motor may lack the character of the old naturally aspirated one, the mule-kick of torque from as low as 2 150rpm more than makes up for it. Porsche’s never come cheap, and the 911 Carrera GTS is no exception, but with the standard performance upgrades, usually options on lesser Carreras, you get most of what you’ll need. Standard, you’ll get the Sound Package Plus with 150-watt sound system, as well as an LTE Wi-Fi hotspot, though optional Bose and Burmeister systems are available. Power adjustable Adaptive Sports seats Plus are also available, as are a wealth of other options that can quickly drive the price sky-high. On the safety front, stability control is standard, as are Bi-Xenon headlamps with Porsche’s Dynamic Lighting System, but LED units are available, as are carbon ceramic brakes. 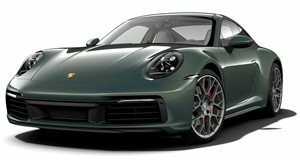 With a wider chassis, more power, and a slew of performance options like the Sports Chrono Package and active suspension all standard, the 911 Carrera GTS is an out-of-the-box road-going champion. Though the options may be nice-to-haves, the base GTS is arguably the greatest value proposition of the 911 range.